Got a presentation looming? A sales pitch that isn't quite doing the job? Or perhaps you've been invited to give a TED talk and are at a loss for what to say? The answer, according to Lawrence Bernstein, director of Great Speech Writing, to is to develop the art of persuasion. 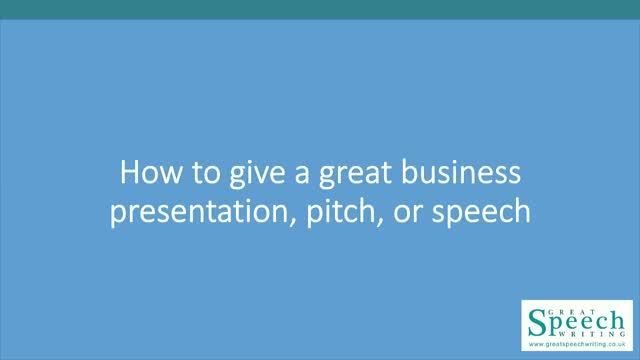 In this BrightTALK webinar, Lawrence will guide you how best to persuade. In essence that means helping you 'translate' what you want to say into what your target audience to hear. Lawrence will be covering topics such as where to begin with writing your content; how to make your message as relevant and original as possible; and sprinkling a little bit of magic along the way. Lawrence's advice has previously been featured on Sky, the BBC, the FT and the Daily Telegraph.